Telegraf collects time-series data from a variety of sources. Chronograf visualizes and graphs the time-series data. Kapacitor provides alerting and detects anomalies in time-series data. You can use each of these components separately, but if you use them together, you'll have a scalable, integrated open-source system for processing time-series data. In this tutorial you'll set up and use this platform as an open-source monitoring system. You'll generate a bit of CPU usage and receive an email alert when the usage gets too high. An SMTP server for sending alerts, along with the connection details. If you don't have one, you can install sendmail with sudo apt-get install sendmail. If you wish to secure the Chronograf user interface as explained in Step 7, you'll need a GitHub account that's part of a GitHub organization. Follow this tutorial to create a GitHub organization. The TICK stack compoents aren't available through the package manager by default. All TICK stack components use the same repository, so we'll set up a repository configuration file to make installation seamless. Now we can install and configure InfluxDB. InfluxDB is an open-source database optimized for fast, high-availability storage and retrieval of time series data. InfluxDB is great for operations monitoring, application metrics, and real-time analytics. InfluxDB is running, but you'll want to enable user authentication to restrict access to the database. Lets create at least one admin user. Execute the following command to create a new admin user. We'll create a sammy user with the password sammy_admin, but you can use whatever you'd like. Now open the file /etc/influxdb/influxdb.conf in your editor. This is the configuration file for InfluxDB. InfluxDB is now configured, so let's install Telegraf, an agent for collecting metrics. Telegraf is an open-source agent that collects metrics and data on the system it's running on, or from other services. Telegraf then writes the data to InfluxDB or other outputs. The Telegraf service starts automatically after installation. You will see the following status, indicating Telegraf is running. Note: If you do not see the telegraf database, check the Telegraf settings you configured to ensure you've specified the proper username and password. As you can see, Telegraf has collected and stored lots of information in this database. You can view usage instructions for each input plugin by running telegraf -usage plugin-name in a terminal window. Now that we know Telegraf is storing measurements, let's set up Kapacitor to process the data. Kapacitor is a data processing engine. It lets you plug in your own custom logic to process alerts with dynamic thresholds, match metrics for patterns, or identify statistical anomalies. 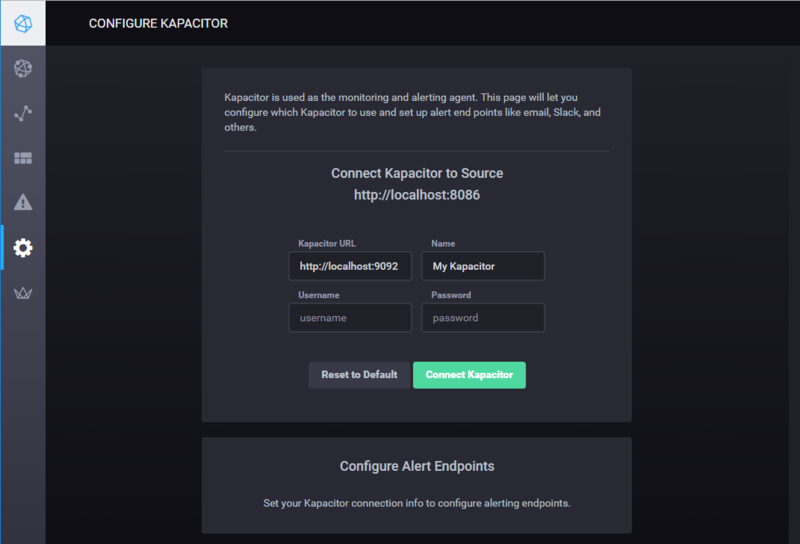 We will use Kapacitor to read data from InfluxDB, generate alerts, and send those alerts to a specified email address. With Kapacitor installed and configured, let's install the user interface component of the TICK stack so we can see some results and configure some alerts. Chronograf is a graphing and visualization application that provides tools to visualize monitoring data and create alerting and automation rules. It includes support for templates, and has a library of intelligent, pre-configured dashboards for common data sets. We'll configure it to connect to the other components we've installed. Follow the tutorial How To Set Up a Firewall with UFW on Ubuntu 16.04 to learn more about UFW. Now you can access the Chronograf interface by visiting http://your_server_ip:8888 in your web browser. Enter the username and password for the InfluxDB database and click Connect New Source to proceed. Now let’s connect Chronograf to Kapacitor to set up an alert. Hover over the gear icon in the left navigation menu and click Kapacitor to open the configuration page. Use the default connection details; we didn't configure a username and password for Kapacitor. Click Connect Kapacitor. Once Kapacitor successfully connects, you'll see the Configure Alert Endpoints section appear below the form. The simplest communication method is SMTP, which is selected by default. Fill in the From email field with the address from which alerts will be sent. Then fill in the details for your SMTP server, or leave them at the default values if you have installed sendmail. Then click Save. With the configuration in place, let's create some alerts. Let's set up a simple alert that looks for high CPU usage. Hover over the exclamation mark icon in the left navigation menu and click Kapacitor Rules. Then click Create New Rule. In the first section, select the time-series by clicking on telegraf.autogen. Then select system from the list that appears. Then select load1. You will immediately see a corresponding graph in the section below. Above the graph, locate the field that says Send Alert where load1 is Greater Than and enter 0.8 for the value. You can hover your mouse over the entries in the Templates section to get descriptions of each field. Then choose the Smtp option from the Send this Alert to dropdown list and enter your email address in the associated field. "Message":"TEST:nil is CRITICAL value: 1.25"
You can set up more human-readable messages for the mail alerts. To do this, enter your message in the text box with the Put email body text here placeholder. You can rename this rule by clicking its name on the top left corner of the page and entering a new name. Finally, click Save Rule on the top right to finish configuring this rule. Let the command run for several minutes, which should be enough to create a spike. You can stop the command at any time by pressing CTRL+C. After a while, you will receive an e-mail message. Additionally, you can see all of your alerts by clicking Alert history in the left navigation menu of the Chronograf user interface. Note:Once you've verified that you can receive alerts, be sure to stop the dd command you started with CTRL+C. We've got alerts running, but anyone can log into Chronograf. Let's restrict acess. 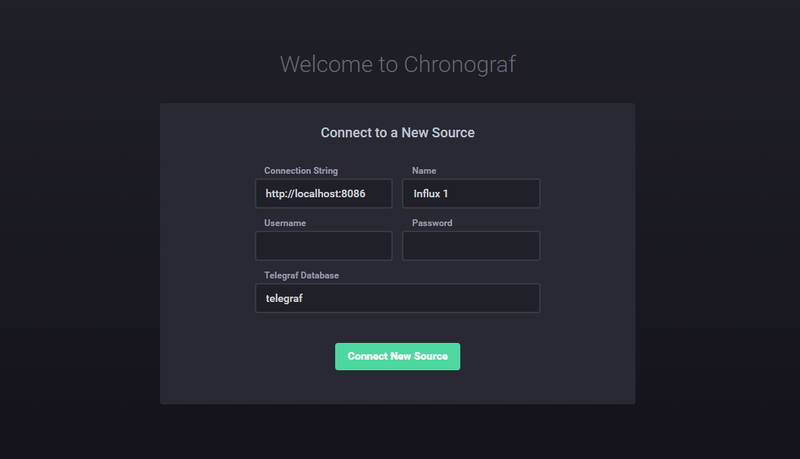 By default, anyone who knows the address of the server running the Chronograf application can view any data. It's acceptable for the testing environment but not for production. Chronograf supports OAuth authentication for Google, Heroku, and GitHub. We'll configure logging in via a GitHub account, so you'll need one to proceed. First, register a new application with GitHub. Log into your GitHub account and navigate to https://github.com/settings/applications/new. Fill in Application name with Chronograf or a suitable descriptive name. For the Homepage URL, use http://your_server_ip:8888. Fill in the Authorization callback URL with http://your_server_ip:8888/oauth/github/callback. Click Register application to save the settings. Copy the Client ID and Client Secret values provided on the next screen. The secret_token is required by all OAuth providers. Set it to a random string. Use your Github Client ID, Github Client Secret, and Github Organization for the other values. Warning: If you omit the Github organization option from the command, any Github user will be able to log in to your Chronograf instance. Create a Github organization and add the appropriate users to the organization to restrict access. Open http://your_server_ip:8888 to access the Chronograf interface. This time you'll be presented with a Login with Github button. Click the button to log in and you'll be asked to allow the application to access your Github account. Once you allow access, you'll be logged in. In this tutorial you saw how the TICK stack can be a powerful tool for storing, analyzing and visualizing time series data. It has many features and use cases. For example, you can use Kapacitor to perform anomaly detection or build live leaderboard of game scores. You can learn more about TICK stack by reading the official documentation.